Ok, so mainstream media has given wide coverage to the fact that Google has changed their maps in Google Insights section to show full Jammu & Kashmir as part of India. Apparently that’s not the case – Google Maps on insights still showing only half the state as it was showing previously. It may be possible that Google is still in the process of updating its servers – Has anyone else witnessed the same ? I tried various combinations to see if the map has been updated – The above map is picked up by using search term “India” for region “India” – Link. Would love to know if anyone else has seen the updated maps ! 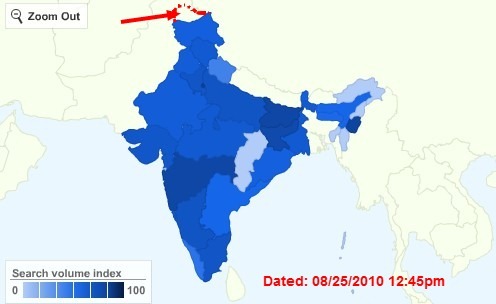 "Google still shows wrong Indian map – Has the change really been done ? ", 5 out of 5 based on 1 ratings. Google should include all parts of INDIA. guys, fighting with each other is all stupid. i am a citizen of india and i think that no government, either india’s or pakistan’s, is perfect. and i think that the comments made by some people here against india can be true. but fighting with each other over the faults of governments is not good. Yaaaaa…indiots are the biggest demoncracy of the world…. Now, failed states will teach Indians about democracy!!! So much for the democracy you indians claim to preach or have…………which i know is FAKE, and proven by you for deleting my comments, which was fairly balanced. If I were you, I would concentrate on saving little bit of the kashmir that is occupied, which seems might end up joining Pakistan or becoming compeletly independent instead of “crying me a river” to google. Google might have changed the map for you kids in india cause the map didnot change for other countries outside india. Who the Hell told you people of kashmir want to be pakistanies?? they havent lost their minds dude.. Even Pakistanis dont want to live there. Living in Pakistan wont be any different than living in hell.. so keep your advice and maps to yourself we dont care! try not ending up giving anything to china which is not yours!!! else one fine day you will find whole of pakistan being occupied by china!!! The writing is on the wall. look at the Kashmiris in Azad Kashmir. Have you ever seen them demanding freedom from Pakistan? There has never been protest in Azad Kashmir, and Kashmiris enjoy freedom there. Kashmiris are happy with Pakistan, its a fact and dont you have a heart attack. No matter how much you do your Pak bashing, the reality is that Kashmiris hate indians and india….they dont have anything in common with india. They want your Army out of Kashmir and the occupation needs to end.